Imagine being a fly on the wall during a conversation between a couple of South Asian Fashion’s biggest titans. Unreal, right? So whether you’re an aspiring designer yourself or just a fashion-lover that wants to know the musings of one of fashion’s most popular, keep reading for Shyamal & Bhumika’s take on our questions about Fashion, Business and Personal! What tips can you give to brides who are searching for their personal style? In our opinion, a bride should look for her own unique sense of style and fashion that’s not ruled by the trends. This will make her stand out. 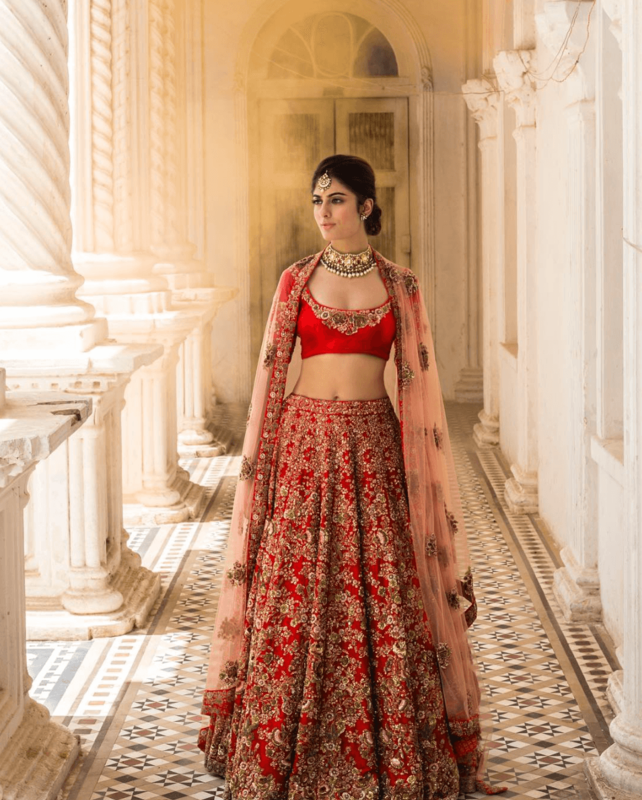 It is imperative to choose the right kind of outfits and accessories that go with the wedding and traditions but what would make the entire trousseau stand out is her personality. 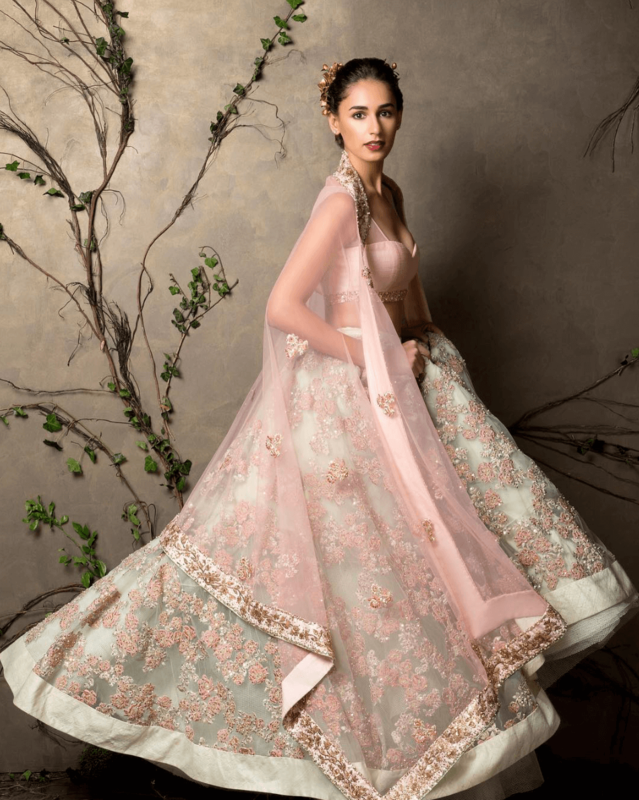 Brides can choose asymmetrical lehengas with detailed blouses, long trailing gowns or jackets with lehengas in terms of silhouettes. Each bride should choose colors that suit her skin tone. 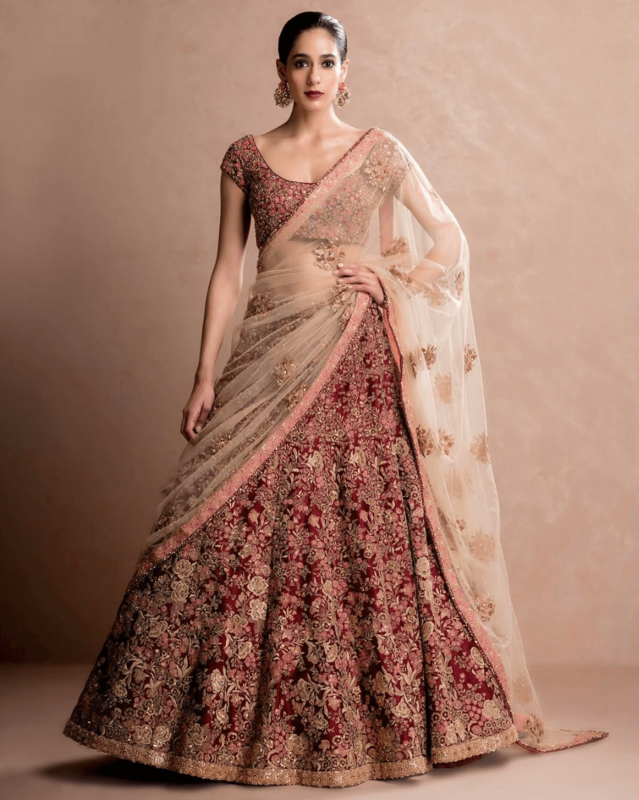 A signature lehenga or saree paired with jeweler that goes with the design sensibilities of the outfit is recommended for all who are unsure about their style. Being comfortable and relaxed is the key to being a stress-free bride. Be happy, take a deep breath and enjoy every moment. Take ample rest before the ceremonies begin. 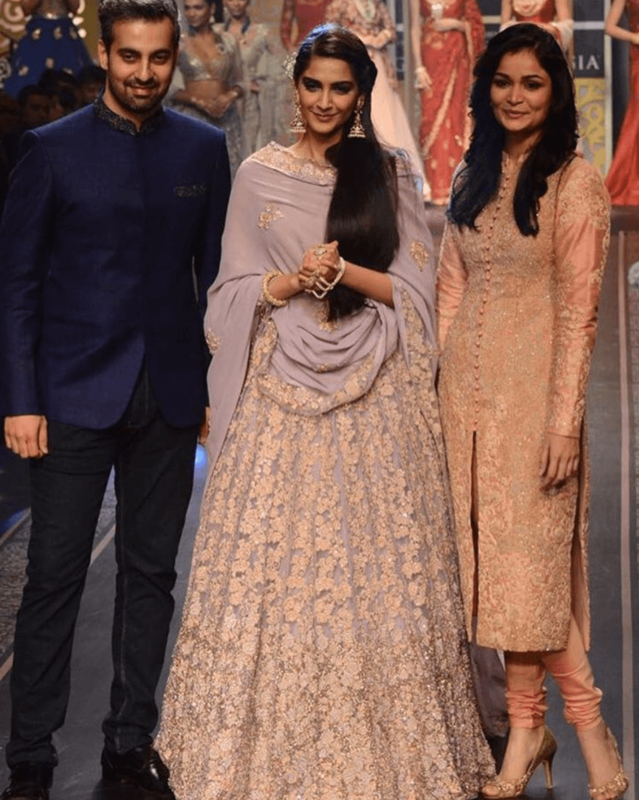 What is Shyamal & Bhumika’s vision for the modern day woman? The modern day woman is very much like our muse, who is an independent and confident woman of today. She is elegant and sophisticated, with global exposure and values her roots immensely, regardless of where she lives. She emulates timeless beauty and effortless style. She appreciates the craft done by hand, its uniqueness and rarity. She is keen on absorbing all that the world has to offer, yet creates her own identity interwoven to her roots. When starting a new piece, what is your process like? The initial phase starts with an idea, concept or a theme. We then start detailing out the collection, in the form of silhouettes, art work, motifs, etc. We study, research and experiment with various materials, colors, embroidery techniques to finalize the detailed intricate work of every outfit of the collection. We work with different dyeing, embroidery and even hand-stitching techniques. In embroidery, we copiously use intricate Aari, Zardosi, Resham, Marodi and even Appliqué, Peeta and Khaat. We make each design unique and the aesthetic very modern day. What advice can you give to any designer-loving bride? Each designer has a unique design philosophy and is known for his/her particular aesthetic. Choose the designer who suits your personality the best. The services provided by the designer, in terms of trials, alterations and customizations are also important. The most important, however, is to ensure that the wedding ensemble embodies your individuality and aesthetics. 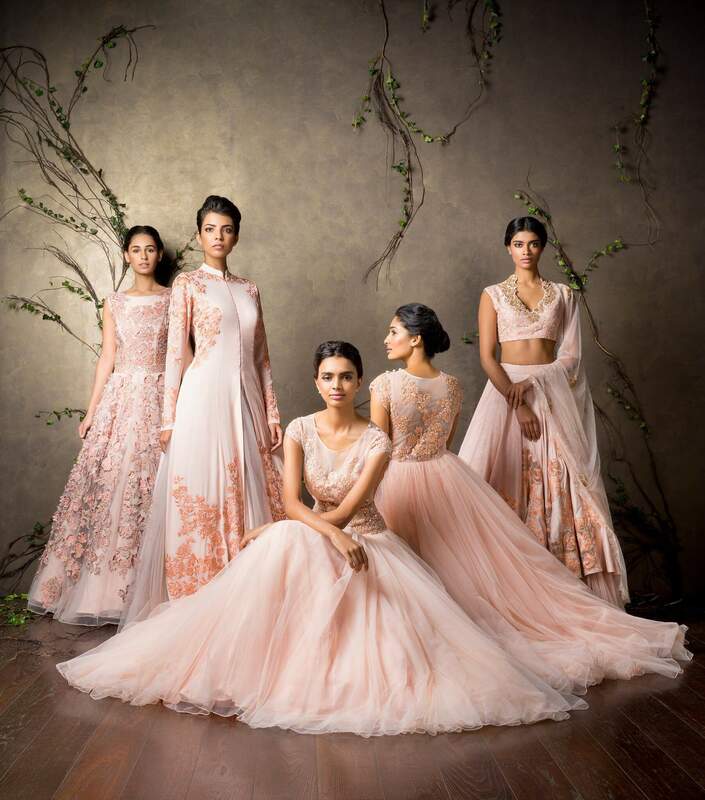 At Shyamal & Bhumika we have an online shopping team that gives a curated boutique experience to brides from all over the globe. 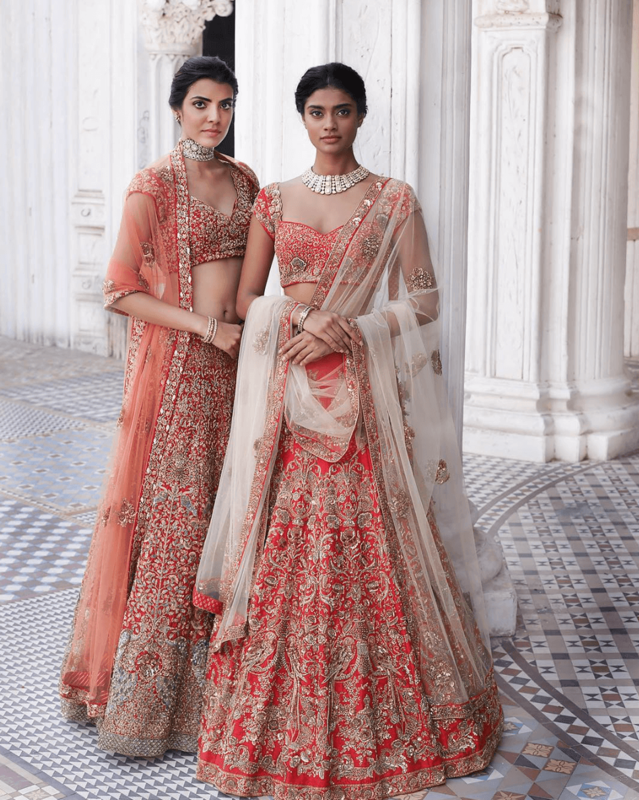 Our stores in Mumbai and Delhi are beautifully designed for brides to come and experience a mix of couture and heritage. 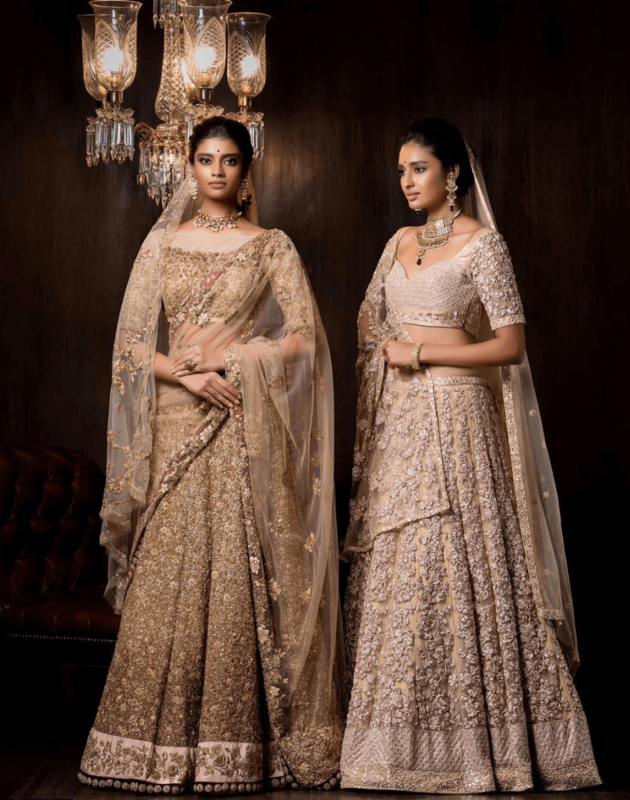 How do Shyamal & Bhumika outfits look and feel different than other brands? What differentiates them? We always use traditional elements even in our trendiest of ensembles. We combine traditional crafts and modern silhouettes. We have been using age-old craft in a new way that appeals to the modern aesthetic of our brides. We create clothes keeping in mind our muse, her tastes and experiences too. Our intricately hand-worked and handmade timeless ensembles create an everlasting impression on all. How has the destination wedding increase changed the fashion industry? Destination weddings give brides a chance to explore their personality and diverse choices. 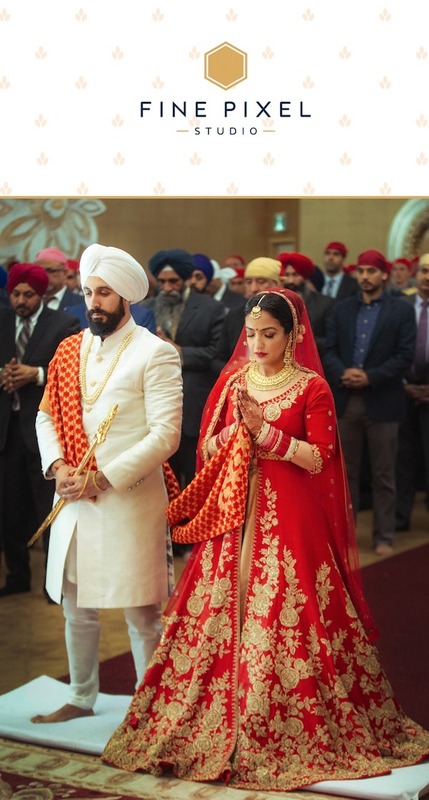 They now choose clothes that have design details, embellishments and colors that go with the setting of the wedding. The diversity of ideas that we get to work with is a welcome change. For convenience, brides are also looking for ensembles that are light in weight and easy to carry and maintain. Handcraft is the most important aspect of what we do. Following our love for hand woven fabrics and hand embroidery techniques we would like to see people appreciate the rare art created by artisans. We want more people to start appreciating the uniqueness of natural hand woven fabrics, hand embellishing and also hand finishing that are not present in machine made clothes. We celebrate couture for its exceptional artistry and fine details and treasure the rare beauty it brings to the world of fashion. What is your personal favorite outfit you’ve ever made? Why? Each outfit is special as it is made for a bride. These ensembles are almost like our babies, we cannot choose a favorite. What are your favorite things about the fashion industry? The versatility and diversity of the fashion industry have always fascinated us. We are intrigued by the remarkable history, ideas, and knowledge that manifest through every individual who has a different, more innovative; more captivating thought to share with the world. What tips can you provide to up and coming designers? You should have a vision and stand by it at all times. Be creative and original in all that you do. Always listen to your heart and instinct. Follow your passion and success will follow. -Vision. Creativity. Originality. Follow your heart and passion. What conventional wisdom did you ignore when building Shyamal & Bhumika that worked for you? Well, we have always believed in natural, biodegradable, hand woven fabrics such as matka, tussar, raw silks, khadi, etc. We did not use mill made synthetic fabrics that were more commercial. Contrary to expert advice we stood by our principles and since then have used hundreds of thousands of meters of natural fabric that has generated employment and kept nature from harm. Inspirations are all around us. From the architectural grandeurs of our ancestral homes, our personal travels and tales we’ve grown up listening to, have all inspired our work. Our biggest inspiration comes from our mission of spreading the beauty of Indian craftsmanship all over the globe. Today, we support diverse types of age old crafts; our most important project being that of reviving the ancient weaving technique from the Gujarat Region which is the Amdavadi Real Zari Weaving Technique. We also take inspiration from the lost world charms, artifacts and architectural wonders that signify our collection and recreate the essence of the erstwhile era. Who are the people you’ve learned most from or followed closely in this last year? Not year specifically, but more than fashion we are influenced by the culture that surrounds us. Living in Ahmedabad, which is India’s first UNESCO World Heritage City, brings with it pride and a reflection into a different, more humble, more unassuming culture. Our family has always respected the Gandhian philosophy, which reflects in the way we live, think and design. We craft our ensembles with non-violence, self-discipline and humility. Our natural fabrics are biodegradable and our handcrafted designs create employment for thousands. What are some choices you’ve made that made you who you are? Our choices have revolved around our most important vision, to take India to the World. We have worked with artisans and create timeless couture that defines the essence of our design heritage. We create bespoke masterpieces for brides and groom who share our aesthetics and believe in what we do. So how’s that for an intense interview with some of the most influential creatives in the world of fashion? We appreciate the time and effort from the Shyamal & Bhumika team in answering our questions. What can we say, we were curious! And you can bet that we will never pass up an opportunity to explore the minds of such successful artists and creators in the realms of fashion, business and personal. We hope you enjoyed reading this interview as much as we did! Remember, House of Raina, located in Vancouver, Canada (where we’re from!) 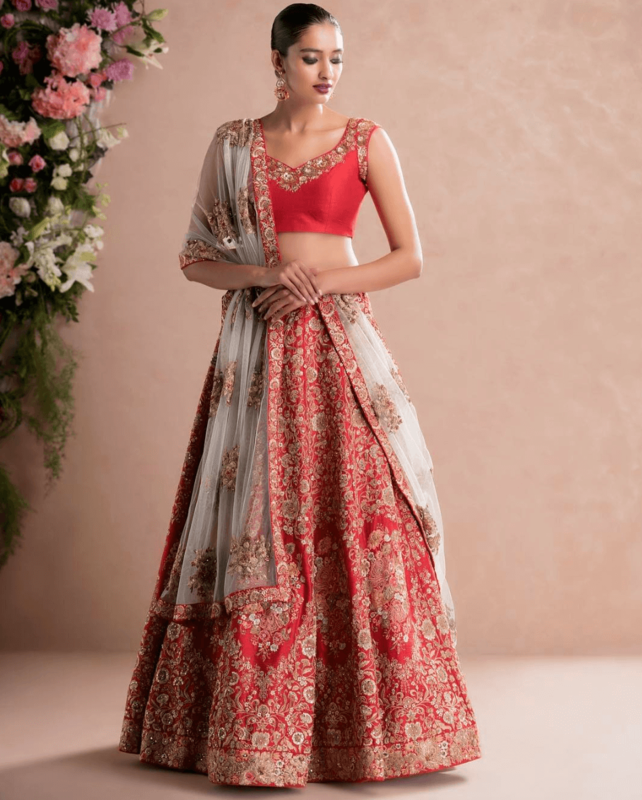 is an exclusive retailer of Shyamal & Bhumika. And now, (if it’s even possible) we’ve become even bigger fans of the designer duo.